Here are a few more of my beginning-stage cards. This first one went out to my good friend Karie who is doing simply AWESOME with her fitness routines. I really admire how hard Karie has worked and that she feels and looks absolutely amazing. I wanted to send her a little encouraging card and let her know how much she's appreciated. Card front. 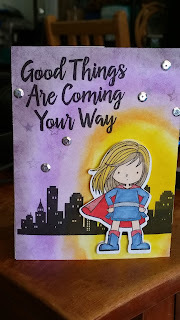 I used distress inks for the background and made a night sky with a circle of 'glow' where I wanted to put the super hero. 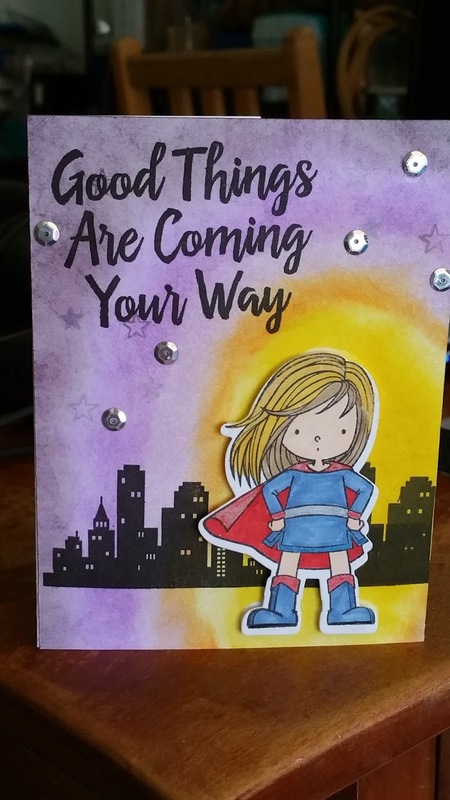 I used a city stamp to use as a backdrop, having to stamp it twice because it didn't extend the width of the card. 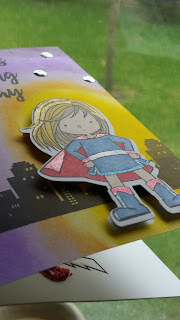 Sequins adorn the front and the super hero is colored with various pens and some sparkle pens to add glitter. I chose to pop the super hero out from the front of the card so I used some foam tape on the back of her. Card interior. 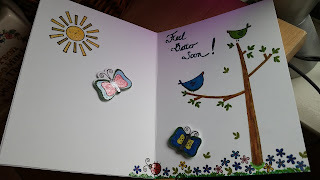 For the inside of the card, I kept it white but added various stamps and used pens to add color. 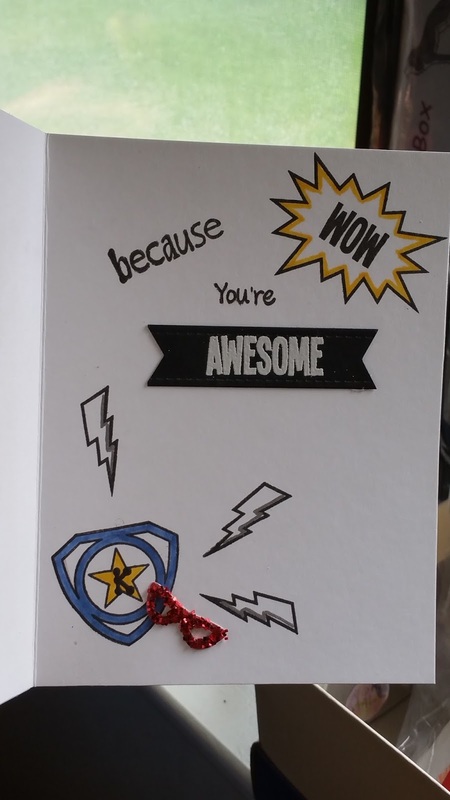 I heat embossed the 'Awesome' word on a separate bit of card stock and I cut out a super hero mask, covered it in red glitter, and then adhered it to the card. There is a 'K' for Karie on the star on the shield. :) I love personalizing things. This next one I sent out to my eldest daughter who is up in Chicago. At the time, she was pregnant with my second grandson and she wasn't feeling very well. I wanted to send her something to cheer her up and let her know I was thinking of her. Card front. I hand colored a tree with various shades of brown. The leaves are cut out of the front card panel and there is a sheet of green tissue behind the panel that make the leaves both green and somewhat translucent. I added some other colored leaves to the tree itself. I just used a gold glitter pen to color in the sentiment. Card interior. 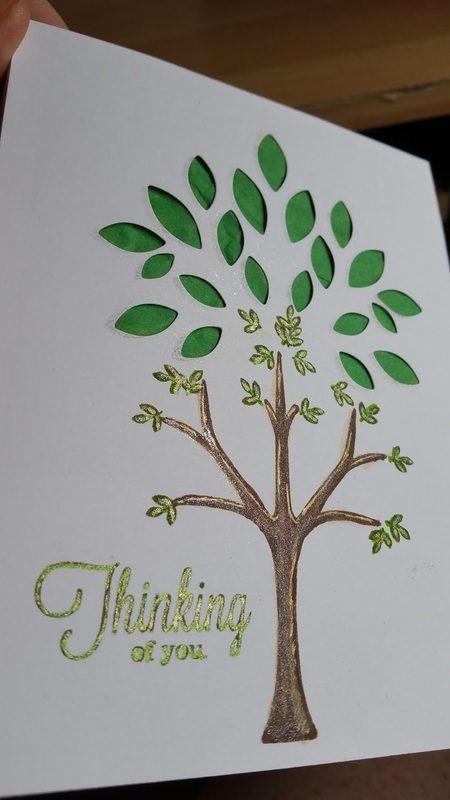 I kept this card white and added another tree to the inside and perched birds high up in the branches. 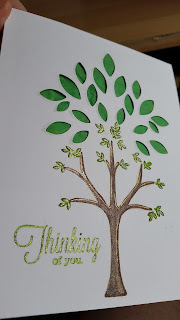 I also stamped and colored leaves in and falling from the tree. I stamped and colored a lot of flowers on the grass at the bottom of the card. I wanted to add more things (ALL OF THE THINGS! ), so I carried the design over to the inside front of the card. I popped out the two butterflies with foam tape. Everything was colored in various pens and markers that I found around the house. 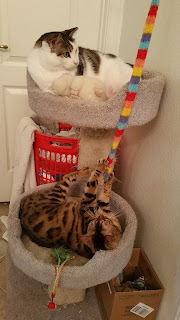 This picture is of two of my cats, Rasha and Rune. How'd that get in there??? Sadly, I had forgotten to take a picture of the card that I sent to my father for Father's Day - I was trying to hurry and get it mailed. I think it was pretty cute but I don't have a photo. :( Sad face. This next card went to my wonderful hubby on Father's Day. Again, nothing really fancy here, I still didn't have a lot of neat toys to play with as far as card making goes. Card front. I used a bit of scrap paper (in yellow) where I cut out a panel for another card and kept the outside to use as a frame for this card. 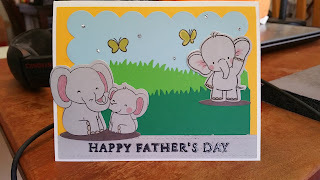 The little elephants are cut out of gray card stock and the grass is cut out of two different green card stocks. Behind it all is some blue paper I had sitting around that worked perfectly for the sky. The shadows under the elephants are from a darker gray card stock. Butterflies and details on the elephants were done in pen. I added a bit of glitter glue for some accents to the front and I heat embossed the 'Happy Father's Day' on a strip of gray cardstock at the bottom. Card interior. I couldn't resist using another cute little elephant for the inside. I kept the grass theme and stamped a couple of flowers. 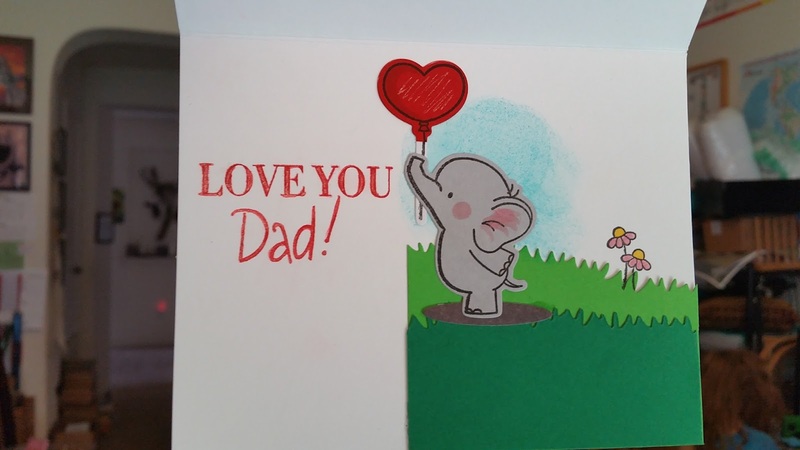 I added a heart-shaped balloon from red card stock for the little elephant to hold. I put all the layered card stocks and design on the right side of the card so that the 'Love You Dad' really stood out on the left. Again, details were in pen. There was so much layered paper on this card that I didn't pop anything out - it would have been overkill. More cards to come. I MAY have an addiction.